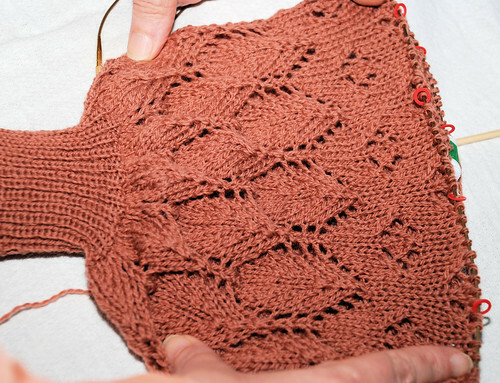 I have started a new group at Yahoogroups for a KAL (Knit A Long) on this pattern. 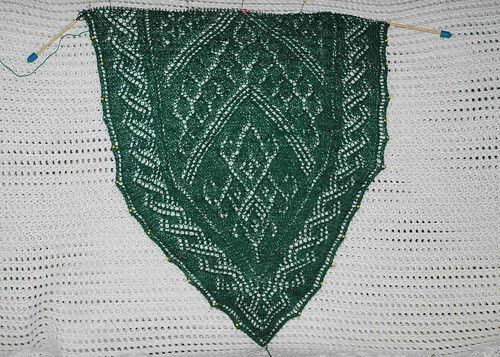 The pattern will be posted to the group (Yarnfeather’s Knit Along). 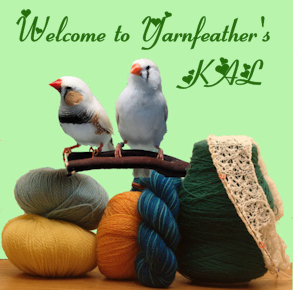 The group’s name is Yarnfeathers_KAL. It is hosted by Yahoogroups (www.yahoogroups.com). 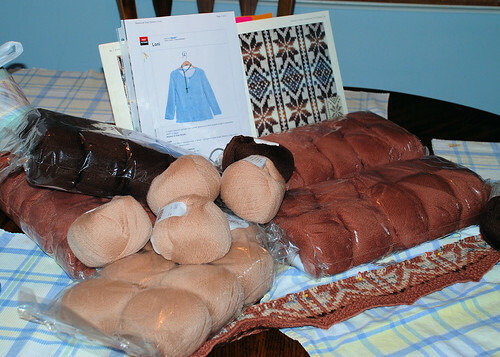 The first part of the pattern will be posted on November 1, 2008. If you are interested please join us there! I have not been very good about putting things on this site. 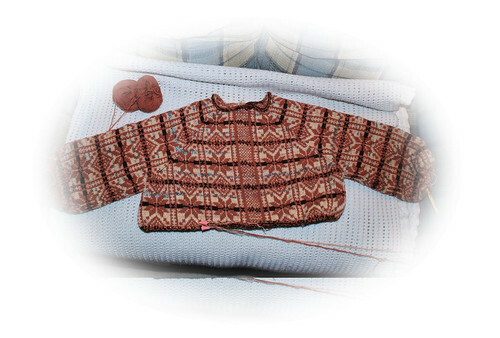 I have been putting information on my knitting projects on Ravelry and I put some more knitting projets on my web site. 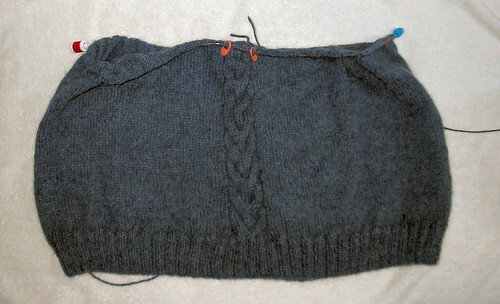 Here is a sweater that I am knitting for my husband Bill. 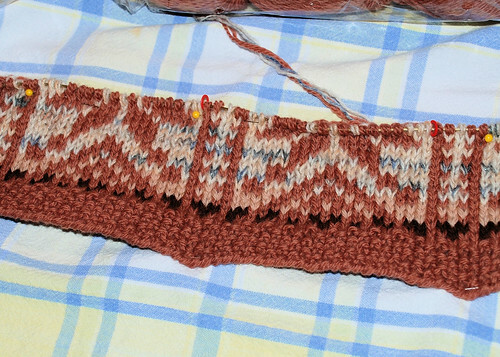 I know I have to take the sleeve in a bit, but right now I concentrating on the pattern and will worry about sizing after I get the pattern down. The jacket is continuing to come along, slowly but surely. Bill took this picture this evening after dinner. 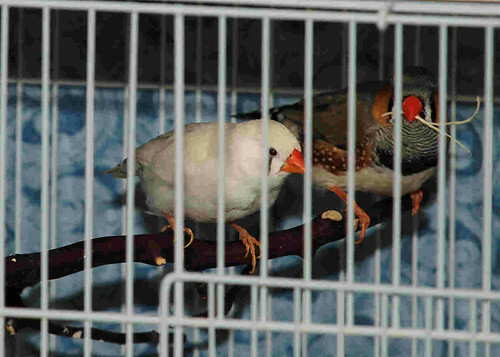 I was cleaning up the cages today and found that a pair of our finches had a surprise for me. I was ready to toss the eggs because I didn’t think they were fertile, but I was surprised by finding these two baby Continental Chestnut Flanked Whites. They are about 4 or 5 days old now. This is the first day their Mom has let us look in the nest. 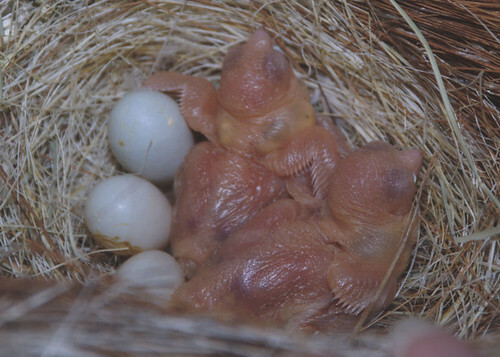 This is the first time these two birds have bred together. We were a little concerned about the male: he is missing one foot and we were concerned that he might not be able to breed properly. Needless to say, he has proved this point…. The color on this photo is much more accurate than the other photos. Instead of using “auto adjust” on the software Bill adjusted it by hand (until I said it was right, of course……) I am working it in the round with a steek and it is going quicker than it would have going back and forth. 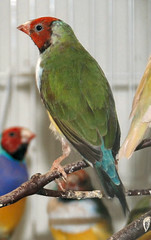 Now I only hope it will turn out…..
We just posted new photos of some of our finches on the web site. The beads really don’t show up, either in the picture or in reality. 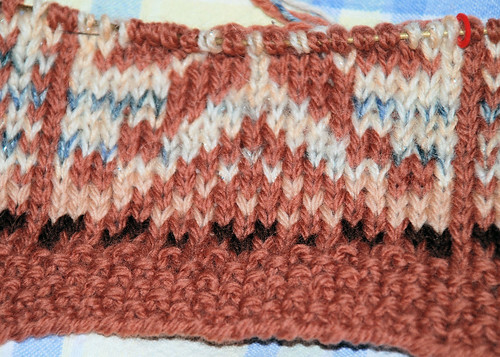 Now I have a day or two to work on other projects before the next clue comes in….. I am contacting tech support with the question. I think I’m beginning to see ocean waves in the outer edge, and it looks like a ram or a bull’s head is starting to appear. I can’t wait for Friday to see the next clue! If I had to guess right now I would say that the theme has something to do with Europa from Greek mythology. I hope you enjoy these photos: now that Bill has his new camera I expect more photos soon! 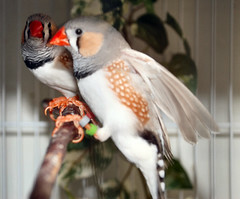 I have been raising finches for several years now. 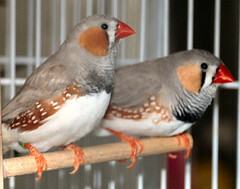 One of my goals has been to successfully breed owl finches. After one and half years of trying without success, we finally have a baby owl finch. We had just about given up on these. Now its time re evaluate and re think our process. 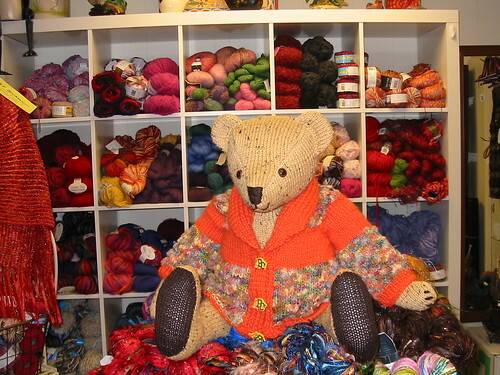 After a long time, the knitted Teddy Bear and his knitted jacket are finally done. Here is a picture of him sitting on a pile of yarn, keeping it warm. He keeps watch over the shop at night. 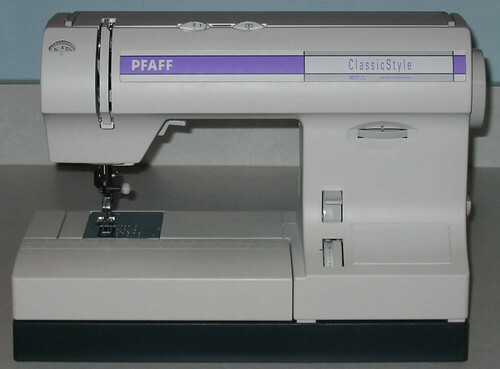 It sews like a dream! I am very happy with this new toy! 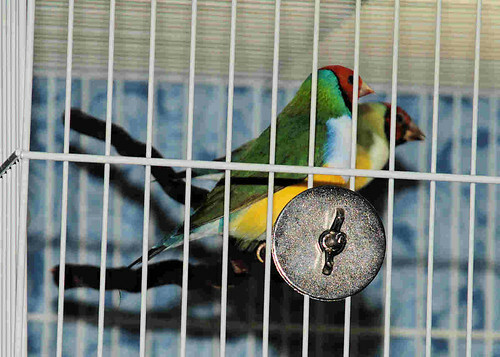 We went to the Baltimore Bird Fancier’s 2006 NFSS and ASFS shows this weekend. 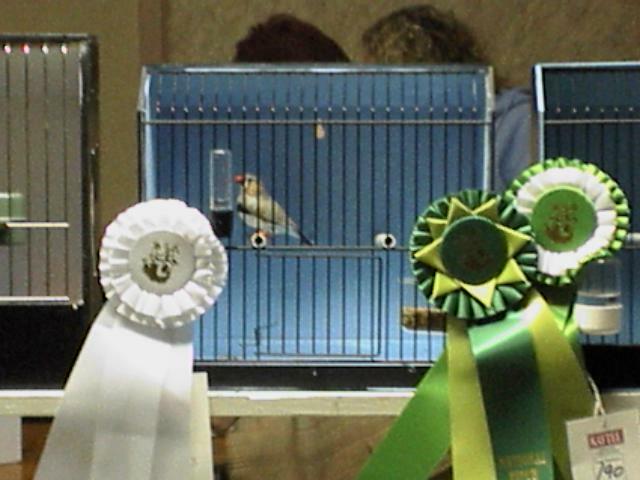 I was especially proud of our son Mark, who entered two Light Back Finches in the show. One of his birds (named Ra) won 4th overall in the show, 1st in section and 1st in class at the NFSS show. He even beat my Black Cheek and Continental Chestnut Flanked White. He also won 1st in the Youth division. 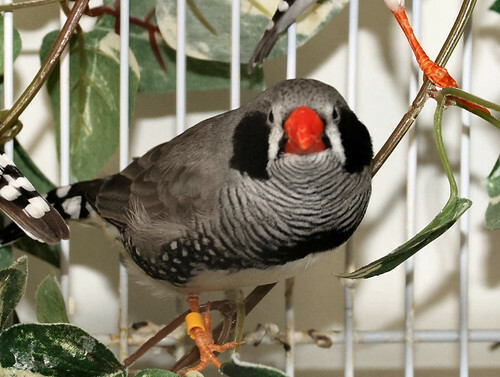 I also showed one of my Owl Finches. 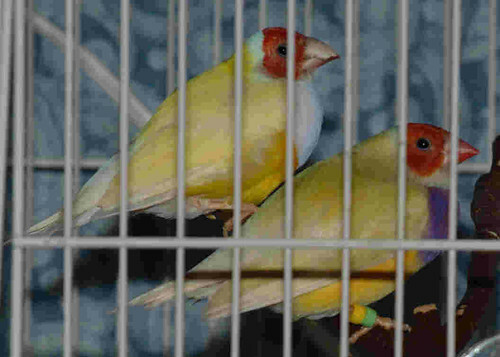 Between Mark and I we had 6 birds entered in the show, which is the most we have ever shown (This is the third show we have entered). It was a wonderful way to spend our Saturday. 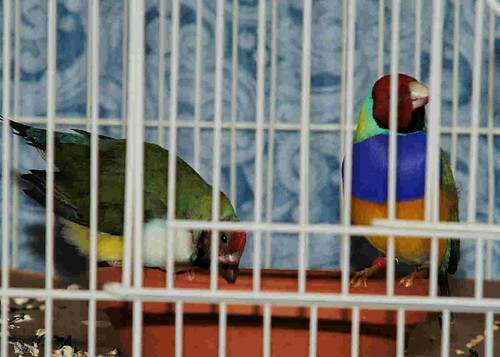 I also bought some more birds (3 red headed white breasted gouldians, 1 black headed white breasted gouldian, a pair of Owl Finches, a grey society finch male which we are planning on breeding with our grey society hen, and another light back hen for Mark). We also learned a lot listening to the judges and are looking forward to the next show. Once these birds are out of quarantine and we are ready to start breeding life will be interesting! 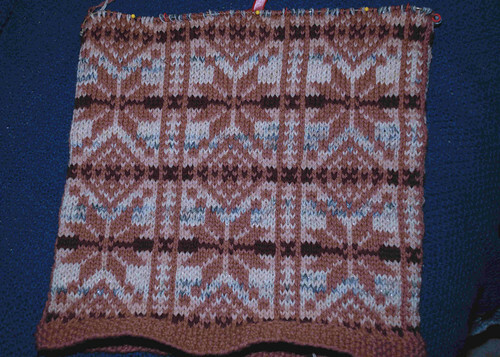 This is vest that I am knitting for my husband Bill. 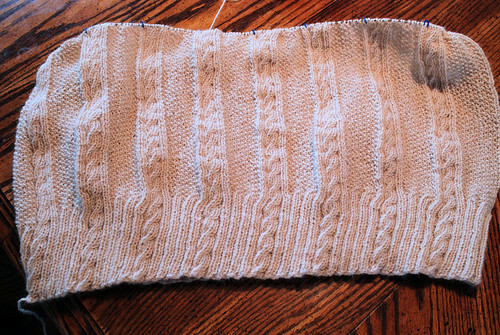 It is made from Classic Elite sport weight yarn on size 6 circular needles. 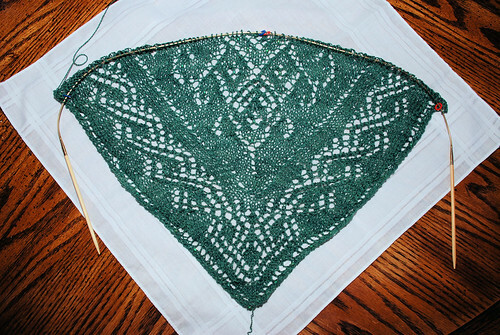 This is a very easy “no brainer” project that is great to knit when I actually WANT to watch the TV show that I am knitting through!